Hi there everyone, I have finally got a chance to join in with one of the blog hops over on smeared ink- I’m really hoping to try and play along most months if not all of them! 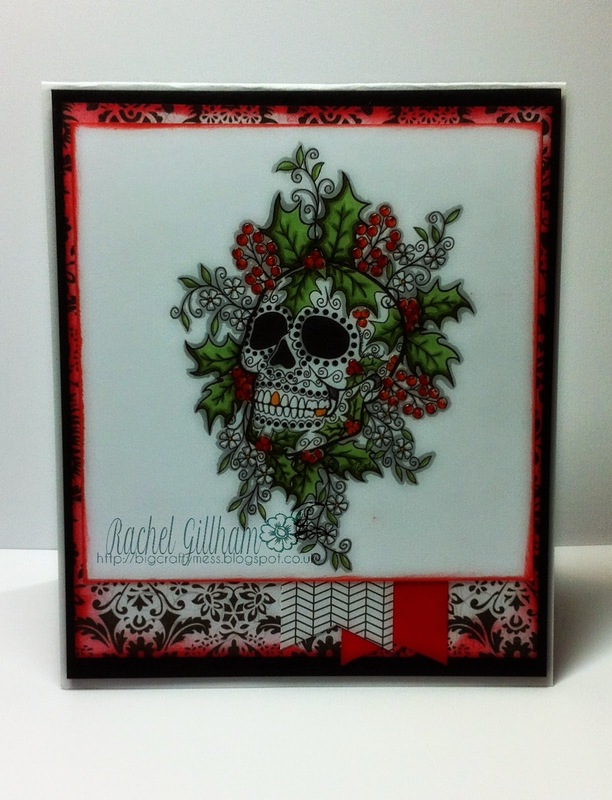 using Holly Sugar Skull which I bought from Delicious doodles before it closed, but GOOD NEWS! it is now on smeared ink! I used copics to colour the image, and then added glossy accents to all the red berries. I chose a fairly simple layout and oddly for me a rectangular card base. I used red berries distress ink round the edges of image and paper. Secondly, I have made the darkest card I have ever made- I was having a really bad day and that kinda helped… and I did feel better afterwards! and also a skull and crossbones paper that was a freebie quite a while ago also from Teri Sherman. This one I coloured in a mixture of copics and promakers as I don’t have the requisite reds in copic yet. I cut a piece of the cheesecloth I bought from That Craft Place , and stained it with red berries and vintage photo distress ink to mimic a blood stained gauze. I painted the black matt behind the image with acrylic paint, with a good lot of texture left in still. i painted ‘snow’ and ‘icicles’ using gesso and some stickles- it didnt turn out entirely how I wanted it to, but I did the best with what I had at hand! the papers are also distressed and edged with red berries DI. I hope you have enjoyed my slightly macabre makes and see you again (hopefully) next month for something else! and here is the blog roll so you can carry on hop hop hopping!